On Sunday, I roped four lovely friends into being guinea pigs for the day. 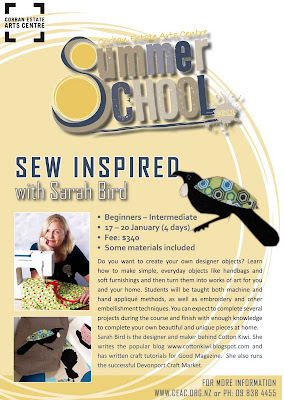 I wanted to do a practice run for my Sew Inspired course and they obligingly said they'd be happy to help. Their skills ranged from beginner to experienced and I was blown away by what they came up with. I took along a huge box of scraps and trims, both vintage and modern. We talked about technique and design, I guided them with ideas and these are just a few things that they made. Aren't they awesome? The top bag and tea towel were made by Aimee of Lilypad Designs and the bottom bag and tea towel were made by my youngest daughter's Godmother and our great friend, Mel, who believe it or not has hardly any sewing experience. I'll show you photos of what the other two friends made if and when I can get my hands on them. If you are interested in registering for my Sew Inspired course, it runs from 17th - 21st January and you can pop along to the Corban Estate website and download an enrolement form. It's that easy! 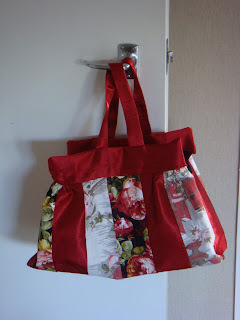 If sewing isn't your thing, pop along to the website anyway. There are some awesome Summer School courses ranging from Bronze Casting to self-portraiture. 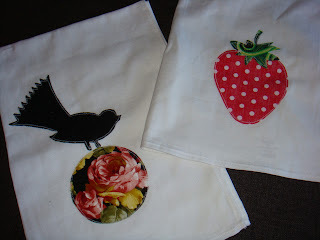 Totally loving the tea towels - so wish I could come!!! I love them! Sounds like a super fun course to do.